When I was 13 years old, I sat with my mother in our suburban Long Island paneled living room, she on a rust-colored corduroy recliner; me, stretched out on the brown shag carpet. She was reading the newspaper and I was watching TV. Out of the blue, my mother said, "I don't know what gay means today, but it certainly meant something else in my time." Her voice was angry; her tone was one of disgust. What had my mother read that had angered her so? When she threw down the newspaper and left the room, I picked it up. The year was 1969. It was the end of June. If you know your LGBT history, you know the article that raised my mother's hackles focused on the Stonewall riots, commonly thought of as the birth of what was then known as the "Gay Liberation Movement." My mother had no idea she had a living, breathing gay person under her very own roof; said gay person -- me -- didn't know either. Remember, it was 1969. There were no Gay Straight Alliances, no gay history courses, no gay literature courses, no LGBT Community Centers, no out celebrities. I had no idea until that moment, when I read about the police raid on the Stonewall bar in Greenwich Village and the way that gay patrons fought back, that gay people even existed. And it took more than a decade for me to realize that I was one of them. For 14 years, all I knew was that I was different than everyone else. I didn't want what my friends wanted: a husband and children. I didn't have crushes on boys the way they did. I had no words to express my feelings of despair when my best friend started spending all her time with her new boyfriend, assuming I would "understand." I spent many miserable years unaware that inside this unhappy hurting heterosexual, there was a happy, healthy (horny!) homosexual dying to come out. I finally came out when I was 27, and living in Northampton, Mass. (nicknamed "Lesbianville USA" by the National Enquirer). I found myself and I found my voice. I had always wanted to be a writer. Now I knew what I wanted to write about. Stories and poems poured out of me like water. Life improved. (As they say, It Gets Better!) I had friends, a community, several published books, and a dark-eyed butch who made every molecule of my body shriek with delight. Still, things were far from perfect. It was 1989. I marched in our local gay pride parade next to a teacher who wore a paper bag over her head so she wouldn't get fired. My beloved and I had a commitment ceremony but our union had no legal status. Lesbians lost custody of their children simply for being lesbians. Gay men lost their lives because no one outside our community -- least of all our government -- cared enough to do anything to stem the AIDS crisis. It was a tough time. Of course things are different now. The marriage equality movement grows stronger by the minute. Don't Ask Don't Tell is a thing of the past. Many high schools -- and middle schools -- have Gay Straight Alliances. There are countless resources gay teens can take advantage of in their communities and on the internet. LGBT role models, including teachers, TV stars, and politicians abound. Even my own mother came around and came to love my beloved (the very same aforementioned dark-eyed butch) as one of her own. My mother also became my biggest fan, frequently visiting bookstores to make sure they not only carried my books, but displayed them face-out on the shelves. In May of 2012, my mother asked if she could read my soon-to-be published novel-in-verse, October Mourning: A Song for Matthew Shepard. This surprised me; my mother made it a point to never read books that were sure to make her sad. And this was certainly one of them. My mother knew that in October of 1998, Matthew Shepard, a gay University of Wyoming student, had been kidnapped, robbed, beaten, tied to a fence and abandoned. She knew that 18 hours passed before he was discovered and taken to a hospital, where he died five days later. She also knew that I had a personal connection to this tragedy: on October 12, 1998, the day Matthew Shepard died, I flew to Laramie to be the keynote speaker for his school's Gay Awareness Week. My mother knew how important this book was to me. And she also knew that she would not live long enough to see the book in print. Still, I hesitated before giving the manuscript to my mother. Her doctor told her she was to stay away from anything that caused her stress. She was battling not one, but two fatal illnesses. My book explores the impact of Matt's murder in a series of 68 poems told from various points of view, such as the fence he was tied to and the stars that watched over him. The last thing my mother needed to do was open a book that would force her to use her imagination to bear witness to the hate crime that claimed Matthew Shepard's life. But she insisted. 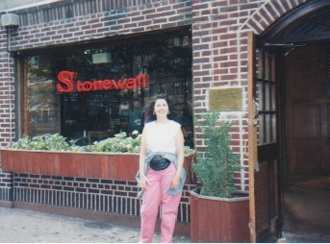 And so, 43 years after the Stonewall riots, I once again sat with my mother in that same paneled, suburban living room. She sat in the same rust-colored recliner; I sat on a stool beside her instead of on the floor. And I watched my mother, at the end of her life, read a book that pleads with the world for LGBT acceptance with both of us wiping tears from our eyes. My mother died on Aug. 22, 2012. October Mourning was published on September 25. And on Jan. 1, 2013, the book received an American Library Association Stonewall Honor. The cover now boasts an award sticker resplendent with an upside down pink triangle. I imagine my mother, up in heaven, beaming down with pride.